The response was euphoric - stock markets railed, risk premiums on the Eurozone periphery fell, and the Euro strengthened - and demonstrated that expectations matters. Without actually doing anything, the ECB was able to catalyze a shift in portfolios toward riskier assets that, if followed through, could kickstart a recovery. It is what Matt O'Brien calls the Jedi mink trick or Nick Rowe dubs the Chuck Norris approach to central banking. This power by central banks to manage expectations is often overlooked or dismissed by many observers. The markets' response to Draghi's speech should give them pause. Now the power of expectation management is nothing new. It is the reason FDR was able to spur a rapid recovery in 1933. It is also why some Fed officials are now promoting an open-ended form of QE. Finally, it also why Market Monetarist have been calling for nominal GDP level targeting for some time. Within our mandate, the ECB is ready to do whatever it takes to preserve the euro. 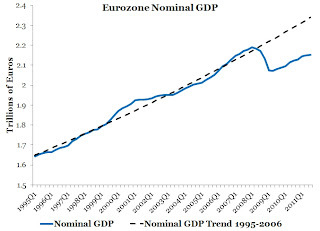 And for the ECB this means closing this large gap between actual and trend nominal GDP. This gap is simply unacceptable. We are now committed to closing it. And believe me, what the ECB does will be enough. Imagine how much greater the response would be to that bold message. The economic outlook would instantly improve, portfolios would be adjusting even faster, balance sheet and wealth effects would kick in, and a recovery would be put in motion. This would not end the need for structural reforms in Europe, but it would vastly improve government balance sheets and cause the private sector to do most of the heavy lifting in the recovery (i.e. the ECB would not need to buy vast amounts of assets). The stakes are high. As Ambrose Evans-Pritchard notes, we are on the cusp of another global economic crisis and Mario Draghi is the one individual who could prevent it. All he needs to do is don his Jedi or Chuck Norris outfit. Putting those outfits on would be a lot easier if the ECB adopted a nominal GDP level target. P.S. Imagine how expectations would change if the FOMC came out with press release like this one at their next meeting. David: Yep. Even the wimpiest version of Chuck Norris (because he gave no numerical targets, and none for NGDP, and nobody knows if the rest of the ECB will back him) still has a lot of power. Nice blogging. 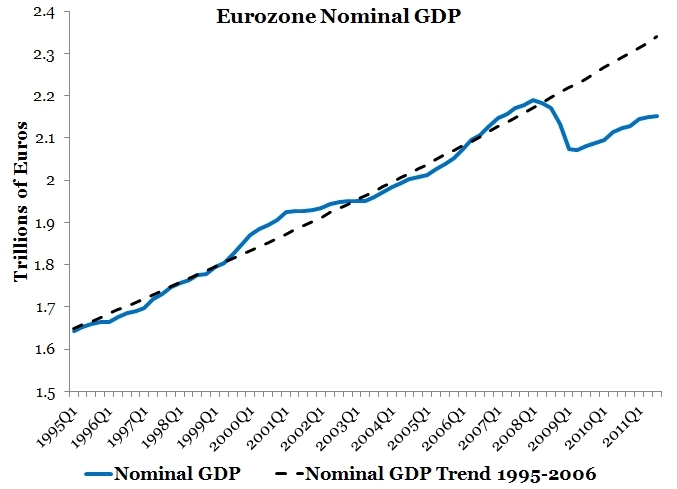 Yes, an aggressive sustained QE program in Europe is needed. And Japan, and the USA. It was a rather remarkable display, on the other hand yields on Spanish bonds were well abovethe level at which Spain has a reasonable chance to be solvent. RJS and OGT, yes the expectation effect does need some backup and its not clear whether Draghi has it. Even Chuck Norris needs to throw a few punches once in awhile to remind everyone he still should be feared. I think you mistake a few days of dumb day traders trying to make a fast buck for something a lot more. The real economy hsa been immune to your so called Jedi mind tricks and Bernanke, the inventor of Jedi monetary policy is now so frustrated he is calling on Congress to act (hah!). Let it play out. This inflation/confidence fairy is going to be MIA. "A few days of dumb day traders"? Really? I guess you think all the professional fund managers widely cited in the press as acting on this speech and all the movement in global equity markets amounts to some dumb day traders. Don't let the facts get in the way of your cherished theory. You mean the same profession fund managers who have been all under performing the market for years now in aggregate? Or the ones that are now so risk averse that they are holding substantial portion of assets in cash and are stuck in a fetal position with their thumbs in their mouth.